It has been one cold, teeth-chattering winter. This past Saturday, however, the D.C. region was visited by upper 60s, early Spring weather and it proved to be a day for everyone to finally enjoy being outside again. Ah, I long for Spring. Jonathan and I had the pleasure of taking my sweet little nephew Joey out to D.C. We’ve been meaning to visit the National Gallery of Art’s exhibit Heaven & Earth: The Art of Byzantium for some time. I had a feeling my almost four-year old nephew would probably enjoy it as well so we brought him along for our afternoon in the city. 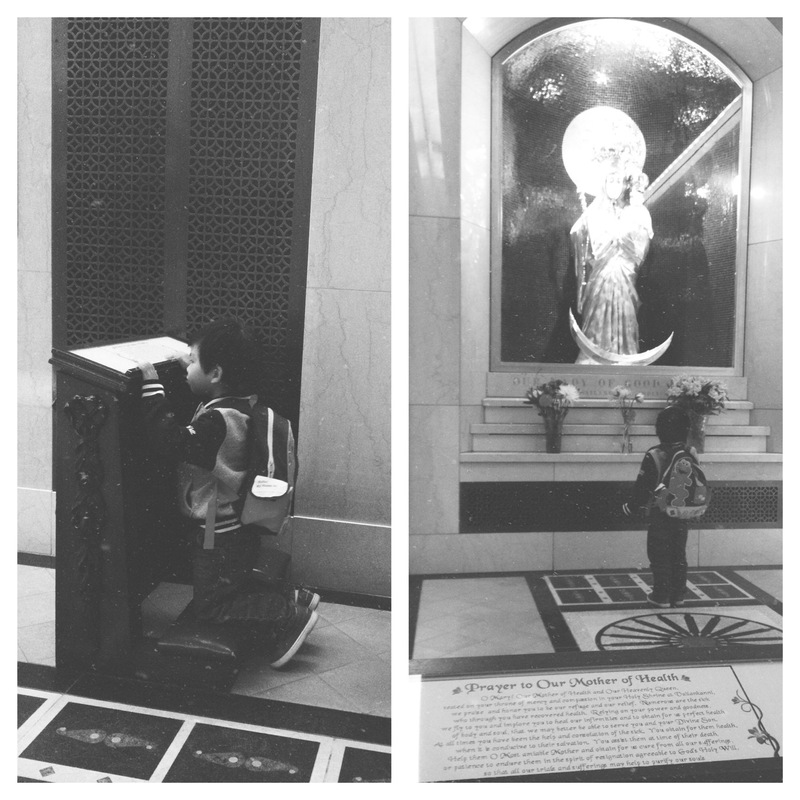 Plus, he has been requesting me to take him to his favorite place–The Basilica of the National Shrine of the Immaculate Conception (this boy says the entire name too)–so we finally did afterwards. When we got to the Basilica, we first walked around the Crypt Church. At a certain point of holding his hand everywhere we walked, I eventually let him walk on his own and lead the way, mostly because I was curious of where he would go. After I showed him to bow before the Lord reserved in the tabernacle, he then led us to the Chapel of Our Lady of Good Health. It was a quiet late afternoon in the Crypt Church. Peaceful, still. It was just us in there. I took a seat in the single pew to the left and Joey did the same on the right side. He looked at me and I smiled at him. My heart at that moment was swelling with joy at the sight of this child’s faith. Then, he knelt on the kneeler for about 10 seconds, got up, walked to the statue of our Blessed Mother and said a prayer along the lines of: “Dear Mary, Mother of Jesus, (he mumbles something here) … Daddy, Mommy, and Maggie. Amen. In the name of the Father, and of the Son, and of the Holy Spirit, Amen.” He crossed himself and everything. Then he repeated this at least five times more. While I am still not sure what his exact prayer was, I still smile today when I picture that moment (shown above) because in my mind I pray, “…but You do, Lord.” God knows our hearts–even the heart of this sweet boy! Even he is praying for his daddy, mommy, and baby sister. Even if he doesn’t comprehend all that is going on, he is praying joyfully! Like I’ve said before in previous posts, it has been a challenging year thus far, but victory is ours. Maybe not now, but it will be. I can’t praise God enough for continuously speaking to me through Joey; a little boy with big faith. I pray for the same childlike faith. I long for Spring–temperate and spiritual. But for now, we endure the cold and we patiently wait in prayer and trust.